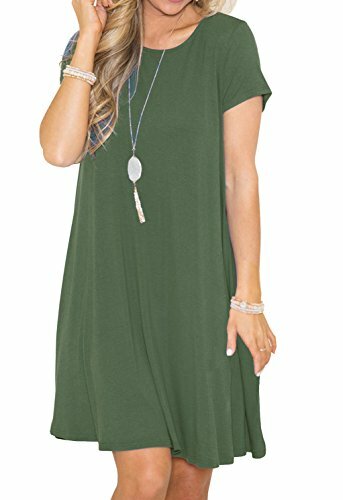 *GRECERELLE Women's Short Sleeve Casual Plain Flowy Simple Swing T-shirt Loose Dress *High quality fabric with exquisite workmanship,and comfy wear, simple design t-Shirt dresses for women, casual shift plain T Shirt dress, casual loose style dresses can paired with leggings, choker and heels, or wearing them alone is a wonderful idea as well,a must have in your wardrobe. *Suitable for any occasion, like beach, evening, party, wedding, and holiday occasion. *Soft and comfy, and fit for any season. 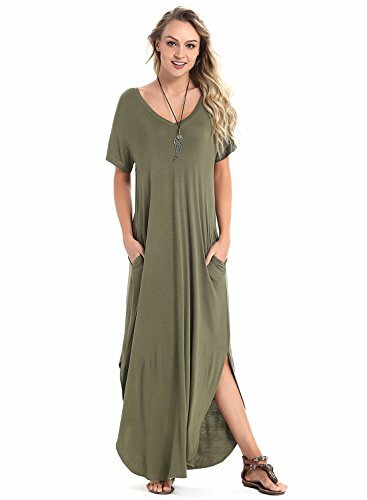 Simple but fashion style dress. *Features: casual style,short length,short sleeve,O-Neck,super soft. 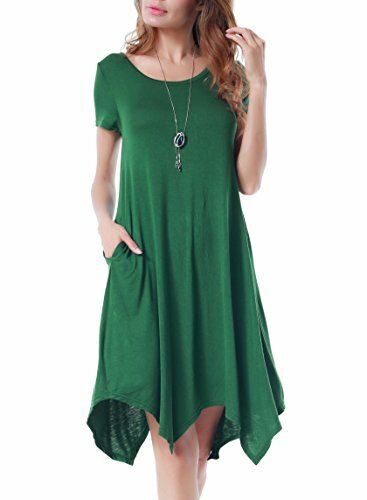 Loose, swing dress,soft and stretchy" *Pattern Type: Solid color, *Sleeve:Short Sleeve A-Line Dress *Multi colors available:Black/ Navy blue / Dark green / Wine red / Army green /Royal blue *Garment Care: Hand-wash and Dry Clean,Do not bleach. *Colors may appear slightly different via website due to computer picture resolution and monitor settings. " levaca is dedicated to the American clothing market.Our design concept is simple,comfortable and fashionable.We dream to help you become the fashion queen.Five years has been spent collecting and analyzing our customers' feedbacks on our products, including information of sizes,materials and quality.Now levaca makes products of comfortable and innovative materials,of fitting Americanized sizes and of reliable quality.If you look through our products in our Amazon store,you'll find that levaca has amazing product comments and customer feedbacks.In this ever changing times, levaca will constantly show new products to help you pursue beauty and fashion. 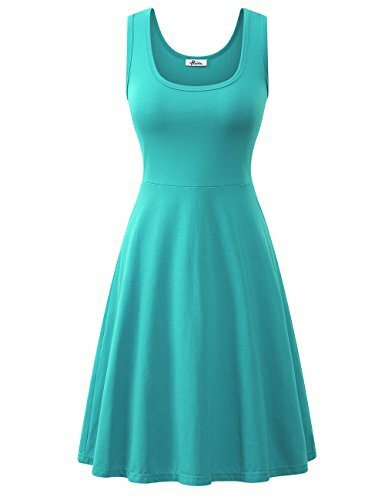 Product Parameters Brand : Yeslife Material : 95% Cotton 5% Spandex Size : S/M/L/XL/XXL Style : Casual Type : Sleeveless Midi Dress Season : Spring,Summer,Fall Item Weight : About 0.6lb Size Chart: S : Bust:31.5 inch Waist:27 inch Length:37 inch M: Bust:34 inch Waist:29.5 inch Length:37.5 inch L : Bust:36 inch Waist:31.5 inch Length:38 inch XL: Bust:38 inch Waist:33.5 inch Length:38.5 inch XXL: Bust:40 inch Waist:35.5 inch Length:39 inch Please refer to our measurement before order Note: -According to the light and different computer monitor, the color may be slightly different as pictures. - Besides, please allow 0.4-0.8 inch differ due to manual measurement.In order to make sure our item could fit you well, please check the measurement details in our description before your order. Thank you! Castle Fairy is a professional specialized flower girl dress store,we have our own 10 more years' experience factory. We provide you high quality clothes and excellant workmanship with lowest price.Welcome customers to do business with us. 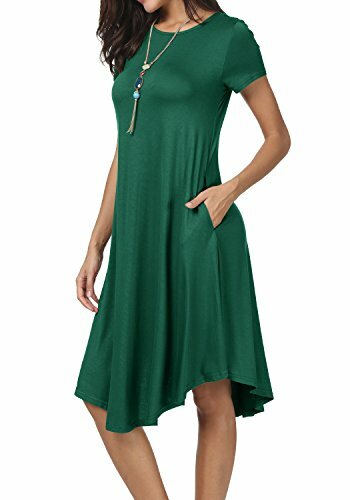 Women's Short Sleeve V Neck Pocket Casual Side Split Beach Long Maxi Dress ✦Casual short sleeves maxi dress are perfect for vacations. 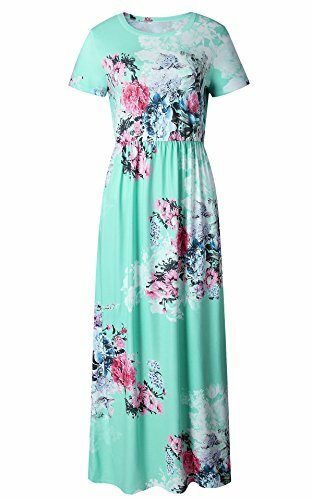 ✦A comfortable summer long dress to wear around the house and/or run errands in. 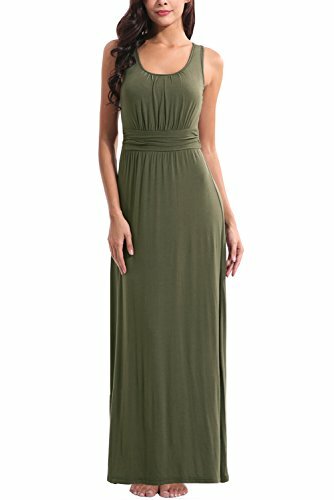 ✦Long and lightweight, a side pocket maxi dress is so comfortable and chic, fit for everyday dressing, work, travel, party, etc. Size Chart: XS: Bust 86cm/33.8'' ---- Length: 130cm/51.18'' S: Bust 90cm/35.4'' ---- Length: 134cm/52.76'' M: Bust 95cm/37.4'' ---- Length: 135cm/53.15'' L: Bust 100cm/39.3'' ---- Length: 136cm/53.54'' XL: Bust 105cm/41.3'' ---- Length: 137cm/53.94'' XXL: Bust 112cm/44.0'' ----Length: 138cm/54.33'' Tips: Machine washable or hand washable, and dry it first before hang it. Notes: There is 2-3CM difference according to manual measurement. Colors may appear slightly different due to computer picture resolution and monitor settings. 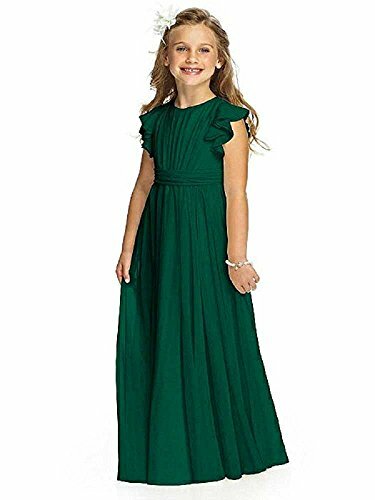 Looking for more Green Soft Dress similar ideas? Try to explore these searches: Heated Yellow Sapphire, White Kidney Bean Extract, and Aurora Borealis Rhinestone Brooch Pin. 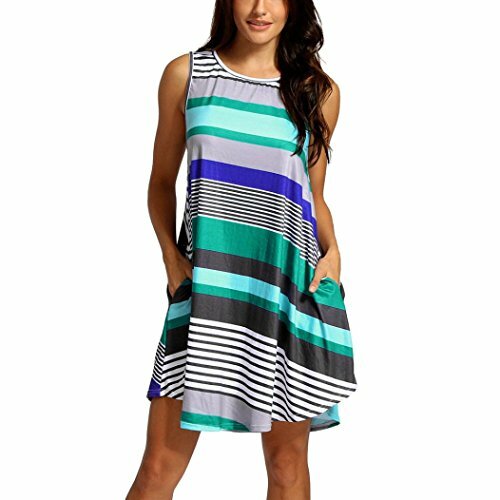 Shopwion.com is the smartest way for comparison shopping: compare prices from most trusted leading online stores for best Green Soft Dress, 4 Piece Countertop Set, Harmonica Method Book, Dress Green Soft . 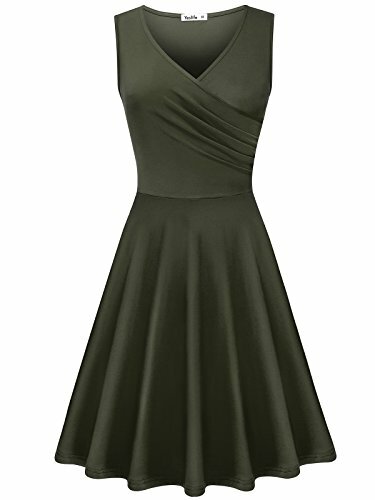 Don't miss this Green Soft Dress today, April 19, 2019 deals, updated daily.